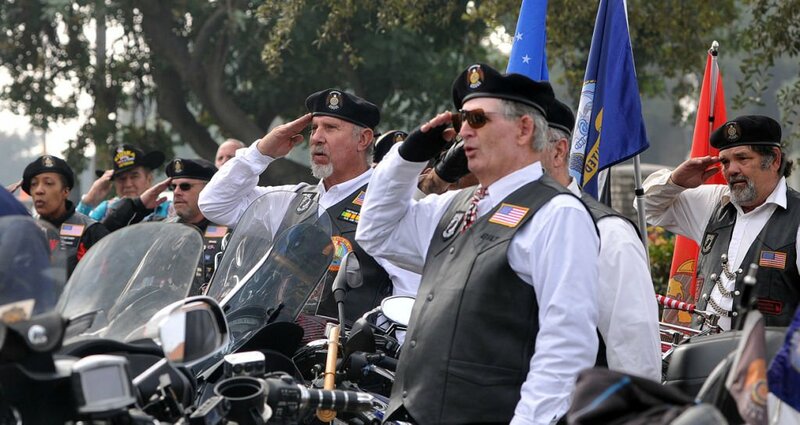 Members of the American Legion Riders salute as the national anthem is sung at the Veterans Day Ceremony held on Tuesday at the Hanford Cemetery. 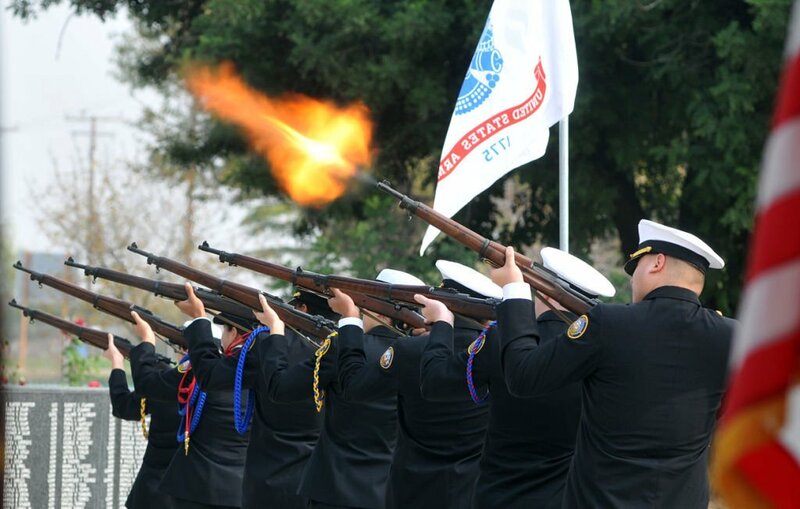 The Hanford West Naval Junior Reserve Officer Training Corps fires of a 21 gun salute at the end of the Veterans Day Ceremony held at the Hanford Cemetery on Tuesday. Retired Senior Chief Petty Officer Paul Merritt talks about his submarine duty in the Navy during the Veterans Day service at the Hanford Cemetery on Tuesday. Sean Skrinde plays taps at the end of the Veterans Day ceremony held at the Hanford Cemetery's tank on Tuesday. The Selma MJROTC goes through an inspection at the at the VFW Nisei Liberty Post 5869 Veterans Day Festival held at the Kings Fairgrounds on Tuesday. Competitions between area JROTCs were part of the festival. Members of the American Legion Riders park their motorcycles before the start of the Veterans Day ceremony held at the Hanford Cemetery on Tuesday. Corcoran High School's AFJROTC goes through an inspection at the Hanford VFW Nisei Liberty Post 5869's annual Veterans Day Festival held at the Kings Fairgrounds Tuesday. Competitions between area JROTCs were part of the festival. Different organizations give out information for veterans at the VFW Nisei Liberty Post 5869 Veterans Day Festival held at the Kings Fairgrounds on Tuesday. Girl Scout Troop 2208 passes with flags flying during the Lemoore Veterans Day parade on D Street on Tuesday evening. The Marine Corps jeep has it's bell rung during the Lemoore Veterans Day parade on D Street on Tuesday evening. The crowd rises to salute the flag as it passes during the Lemoore Veterans Day parade on D Street on Tuesday evening. Kings County honored veterans’ service to their country with several events in recognition of Veterans Day. The American Legion Hanford Post 3 kicked things off with its annual ceremony on Tuesday. The VFW Nisei Liberty Post 5869 held its Veterans Day Festival while Lemoore wrapped things up with its Veterans Day Parade. The American Legion held its ceremony at the memorial tank at the old Hanford Cemetery. This year, the legion decided to recognize the U.S. Navy’s submarine service. Retired Senior Chief Officer Paul Merritt spoke about his experiences with the service and the perils of submarine duty. The Veterans Day Festival at the Kings County Fairgrounds featured musical performances by the band Roadhouse as well as the Lemoore Choir, a car and motorcycle show, drill team competition, activities for kids as well as food vendors. Drawings were held throughout the day for several prizes up for grabs, such as a 40-inch flat-screen TV. According to the VFW post, this year’s festival is in honor of Korean War veterans. American Legion Post 100 sponsored the second annual Veterans Day Parade in downtown Lemoore Tuesday night, in partnership with the Lemoore Parks and Recreation Department. Several local organizations were on hand for the parade, including dignitaries from Naval Air Station Lemoore as well as local legion groups and the Lemoore police and fire departments. The parade also featured a rolling veteran’s memorial that contained dog tags of soldiers killed in action from World War I to the present. The reporter can be reached at 583-2429 or jluiz@hanfordsentinel.com. You can also follow him on Twitter at @JosephL_HS​. Kings County held several events to honor veterans for their service.